I love the color of your teacup, what a find! Wow, rainstorms in N.C. and earthquakes in CA! Sounds like tea weather to me! Love that teacup! The blue is so pretty! Your cup, is a little wonder of beauty, Terri, it makes a wonderfull blogpost. This is a beautiful colour I love it! Wowww this is so beautiful cup Terri. You have a teacup there I would have purchased if I had spotted it in an antique store. Just beautiful! Your weather descriptions had me wondering if you were living in my state, Washington. I love a good rainstorm too, a perfect time for a good cup of tea served in a beautiful teacup. 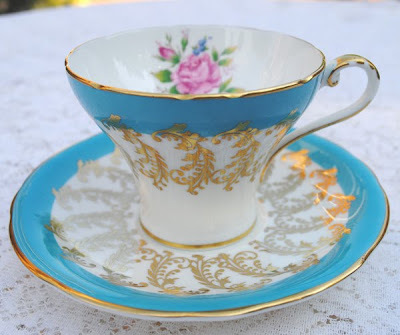 Thank-you for hosting Teacup Tuesday. I am having so much fun with this. Hi Terri...wow...super wow..so beautiful! I love the colors...such dazzling pieces!! Your sweets are divine too....yumm! Hope you have a lovely day..thanks for hosting this wonderful tea party always! Hello Terri :) That is a beautiful teacup you found antiquing! Love the shade of blue, and the roses are so sweet! 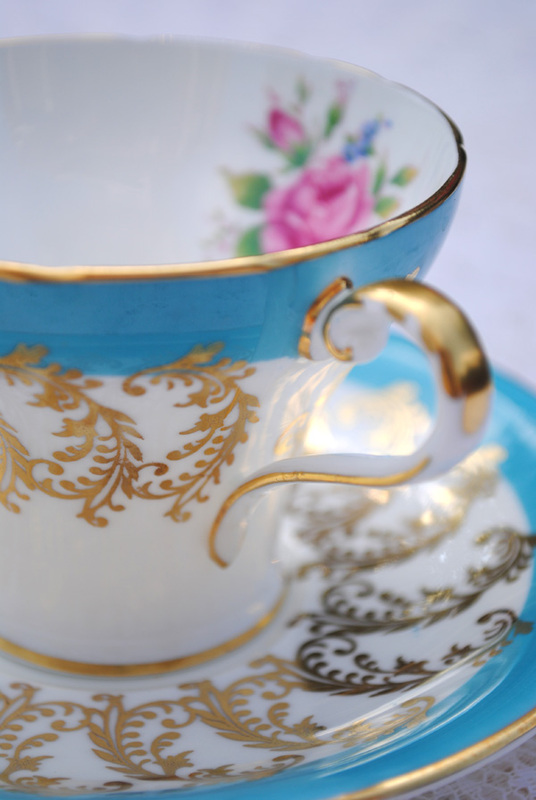 Your teacup is so elegant; love the colour! Gorgeous! Tea would taste so good in it. Sweet little cuppie too. Thanks for sharing and have a lovely day. Terri, gorgeous! Vibrant! You have so many. I'm running out! LOL! I just love the shade of blue in your teacup. Beautiful shade for this cup! Ansley...I am seeing a lot of it this morning and I never heard of it before. I am going to have to learn! Today I haven't words for your tea cup,it´s marvellous,I love that blue color too...Beautifully pretty (really I don´t know if this is correct in english)but I'm sure you understand me. Terri your cup is gorgeous! Such a beautiful blue. Thanks for hosting such a fun day! 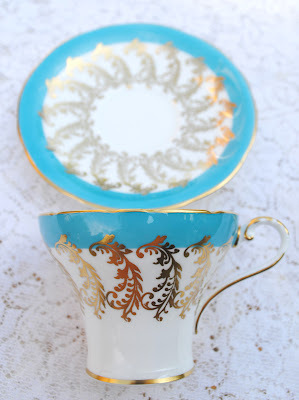 Oh, that turquoise is just beautiful on your newly purchased teacup. It goes delightfully well with that cupcake you baked, too. Aynsley is so popular, isn't it? Seems that they were very prolific in their production. Good for US! Maybe a trip to the second hand store is in order for me, too. 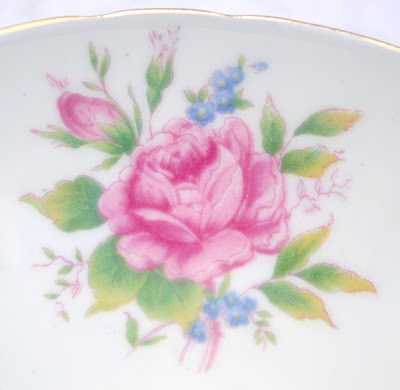 My teacup collection isn't like Martha's (WOW), so I may need to find some new ones to share next week! Lovely post and your weather sounds great. Nothing like a good old thunderstorm to clear the air. Hello Terri- That blue is so lovely. It's so vibrant. A truly beautiful set. Mind if I go antiquing with you some time? You seem to have amazing luck :) Take care. That is one gorgeous teacup. 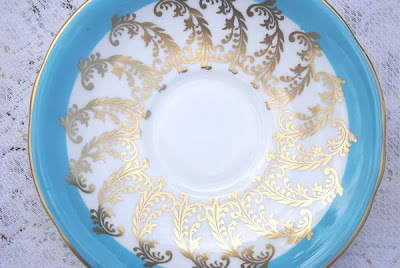 I've never seen such a beautiful blue color and it is great with those stylized gold designs. Yes the weather has been crazy. I went to an outdoor wedding in GA on Saturday and the temp was in the nineties - whew. That is a gorgeous teacup, Terri. I love the delicate design and I am so partial to that color. This is truly a beauty! Incredible colour as everyone has been commenting. The gold and white add a very regal touch. Thank you for hostessing so faithfully. I would love for you to stop by for tea, skipping between the raindrops. That is one gorgeous tea cup and saucer!! I love the colors!! Terri, That cup is just gorgeous! I love it! You did well in your searching the antique stores. This is the most vibrant blue I've ever seen. It is so lovely. I'm having so much fun looking joining in on Teacup Tuesday. It's been fun. 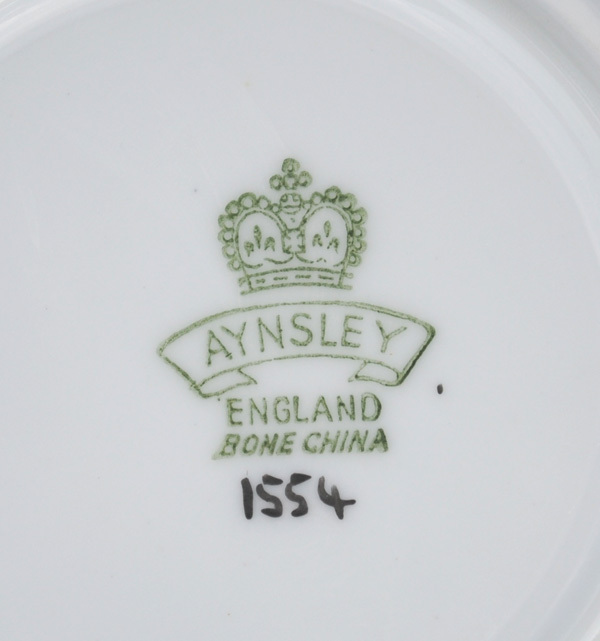 Your Aynsley teacup is gorgeous! The blue is wonderful! And a yummy cupcake to go with your tea, how nice! Dear Terry you can see more about Meander in www meander BV. that is one beautiful teacup! The colors are just gorgeous!! Terri I don't think I have ever seen such a beautiful teacup. Usually I am partial to roses on teacups but that one blew them out of the water. Thanks for sharing with us and thanks for hosting this great party. Gorgeous tea cup and saucer! I love the cool blue and pink roses. Stunning! Thanks so much for stopping by my blog today for Tea Tuesday. I really love your beautiful blue tea cup. You gals have the most beautiful (and I suspect priceless) tea cups. I'm quite impressed by what you and Martha have accomplished in the short time you have started this blog hop collaboration. I won't be able to join you, because I don't have anything of value or beauty, but I will show up to see what you and Martha have to show each Tuesday. We were so lucky today. It has rained here for three solid days, but is sunny today. Sunday we had flash flood warnings and the rivers that run through Wichita, KS have reached the banks. My basement has taken on water, and more rain is coming. Gotta love this time of the year. Hope you are dry! What a gorgeous shade of blue!! I love it. I can see I had better start antiquing as well. I've been a thrift store gal for a few years, but I seldom find things as beautiful as that. 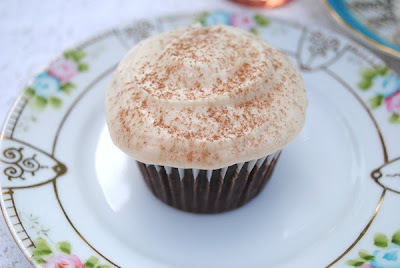 And that cupcake...what a lovely addition to our teatime. A huge thank you to you and Martha for hosting this lovely party each week. I've only been involved for 2 weeks now, but I love it. The spirit of hospitality and welcome is alive and well. your blue cup is lovely ! i've just posted my table "I LOVE PARIS" so you are welcome to come and visit "my little paris" !! You can also use it for your post "French friday" and give the link of my table, i'm sure your American readers will love to wander around Paris and my table with me !